What is Distal Bicep Tendon Rupture? The biceps muscle, located in the front of the upper arm, allows you to bend the elbow and rotate the arm. Biceps tendons attach the biceps muscle to the bones in the shoulder and in the elbow. Biceps tendon tears at the shoulder : Two tendons that attach the biceps muscle to the bones in the shoulder, the long head tendon that attaches the muscle to the top of the shoulder's socket (glenoid) and the short head that attaches it to the shoulder blade. Tears are more likely to occur in the long head of the biceps tendon. Tears of the short head of the biceps are very rare. But even in case of a complete tear of the long head, the short head of the biceps may allow you to continue using your biceps muscle. Biceps tendon tears at the elbow: Although two tendons attach the biceps muscle to the bone at the shoulder, only one tendon attaches it to the elbow. 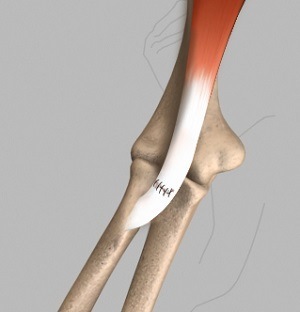 This is known as the distal biceps tendon. Tears of the distal biceps tendon are usually complete, and the muscle is separated from the bone. Tears of the distal biceps tendon most of ten result from a sudden injury or lifting a heavy object. ice application, limiting activity, non-steroidal anti-inflammatory medications to reduce the pain and keep down the swelling. Surgery to reattach the torn tendon back to the bone is rarely needed. However, for patients with partial tears who continue to experience symptoms after non-surgical treatments or who want all their arm strength back, such as athletes or manual laborers, surgery may be the best option. Complications are rare, and a re-tearing of the repaired tendon is rare. Following surgical repair, you will need to do flexibility and strengthening exercises to improve the range of motion in your shoulder.